These slides show a couple more coin related accessories. A wall-mounted frame was surely going to be offered because there were a vast number of coins to send away for. There is a gold medallion molded into the top of the frame just like on the proposed Action Figure case. Next to that slide is one of a military-type medallion that's worn on the shirt. A child could place any coin he wanted into the slot. 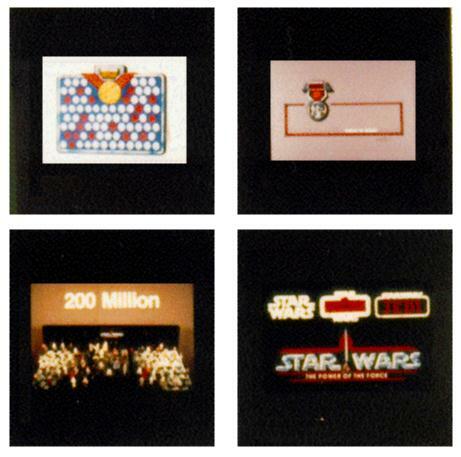 The third slide marks 200 million figures sold by Kenner up throught the mid 1980's. The final slide shows the logos that have graced their main staple of toys over the past eight years with their latest and greatest one being the the most prominent.